Emma Slatter, Deutsche Bank’s former head of strategy, has agreed to join Visa Europe as general counsel to replace Niamh Grogan. In her new job at Visa, Slatter will report to New York-based executive vice president and general counsel Kelly Mahon Tullier and European chief executive Nicolas Huss. Legal Business GC Powerlist 2016 member Slatter will begin her role with the card provider on 20 March 2017, after spending over 20 years at Deutsche Bank in various positions. Most recently, Slatter served as the bank’s global head of strategy for six months between January and June 2016. An internal memo seen by Legal Business in May 2016 indicated that Slatter was set to leave Deutsche Bank to form her own consultancy, advising on a range of business ventures. The departure of Slatter was quickly followed by the exit of another senior member of the in-house team. James Hooper, who acted as Deutsche Bank’s head of active asset management since 2013, left to join boutique investment firm J O Hambro Capital Management as the fund’s second in-house lawyer. 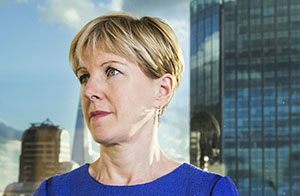 Before acting as head as strategy, Slatter was Deutsche Bank’s UK regional general counsel. She was a key figurehead charged with resolving Deutsche Bank’s legal problems. During her tenure as GC Slatter headed a 150-strong legal team across Birmingham and London. Visa Europe was acquired by US company Visa in November 2015, in a deal worth €21.2bn. Macfarlanes and US firm Wachtell, Lipton, Rosen & Katz advised Visa on the transaction with Linklaters offering counsel to Visa Europe. Earlier this week it was revealed that Deutsche Bank is close to finalising its roster of legal advisers for its global legal panel. Already making the cut were a host of US heavyweights in addition to the Magic Circle. The process saw Deutsche Bank combine its UK and global panels into one. Ashurst and Simmons & Simmons are joined a US contingent of Latham & Watkins, Cleary Gottlieb Steen & Hamilton, Mayer Brown and transatlantic firm Hogan Lovells.